This is the largest courtyard in the complex and covers 57,000 sq. metres, for comparison, a large football pitch is 9000 sq. metres. The courtyard is used for Friday prayers, daily congregational prayers and other religious gatherings. The total capacity is for 100,000 people. 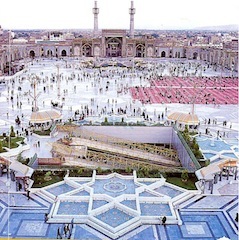 The courtyard is surrounded by 6 large minarets and when they are completed they will be the largest in Iran. There is free mechanised transport and assisted wheelchair access to help people cross the large courtyard in order to get to the Shrine buildings. This courtyard is in the northeast of the Shrine complex. 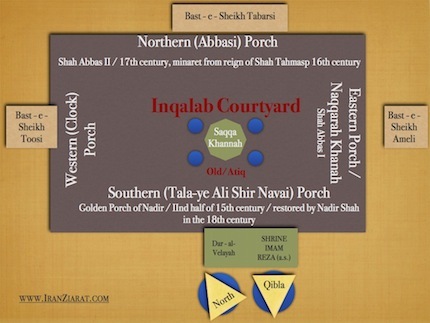 There are four iwans (referred to as 'porches' in the diagram and also in the Astan Quds Razavi literature). This is one of the entrances to the Holy Shrine, used by pilgrims. 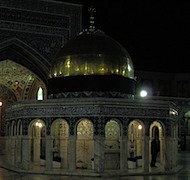 Opposite Abbas' iwan, is the iwan-i-tala-yi-naderi (Nader's golden iwan), which provides access to the buildings clustered around the tomb chamber. Originally constructed by the poet, scholar and musician Mir Ali Shah Navai in the late fifteenth century (in the reign of Sultan Hossein-e-Bayqara), this iwan was restored by Nader Shah who lined it with gold and pendant mirrors. Nader Shah also commissioned the second gold minaret, located above the golden iwan and dated (1145/1732). This porch was also constructed by Shah Abbas. The clocks have been placed here since the Safavid dynasty and the present one was donated in 1948 by a patient who was miraculously cured by Imam Reza (a.s.). The east iwan is topped by the Naqqara-khana (place of kettle drums), these are beaten to sound the end time of prayers (ten minutes before sunrise and sunset) except for the mourning months of Muharram and Safar. They are also sounded on days of religious celebration. When and why the tradition of beating the drums was started is unknown, but they were placed here around 9/10 A.H. Historically they were used by kings to sound the arrival of their processions. This porch was also constructed by Shah Abbas. There are seven people in the Naqqarah Khana, three beat drums and the others blow trumpets. Shah Tahmasp commissioned the first gold plated minaret, located above the northeast iwan (1059/1649), a gift of Shah Abbas II. Decorated with mosaic faience, the northeast iwan is considered one of the finest in Iran. Above the porch are two golden minarets. In the centre of the courtyard is a Saqa Khanaa (drinking fountains), over which a golden dome has been erected. The building is said to have been constructed by Esmail-e-Talai on the orders of Nader Shah. 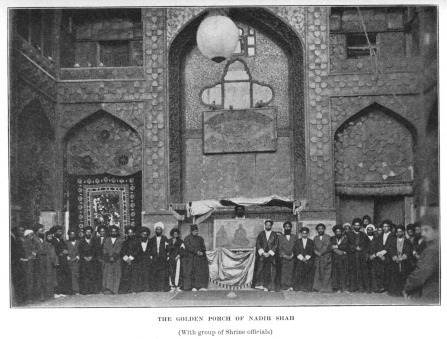 The marble that was used is said to have been brought by Nader Shah from Herat. Around the drinking fountains are four pools which are used by pilgrims for their ablutions. 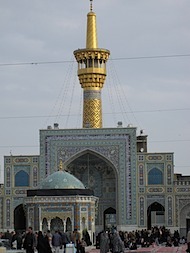 There is a large brassy lattice window on the south side of the Azadi courtyard, where it borders the Shrine. This is known as the Foolad window and many pilgrims come here to pray and have their wishes fulfilled. 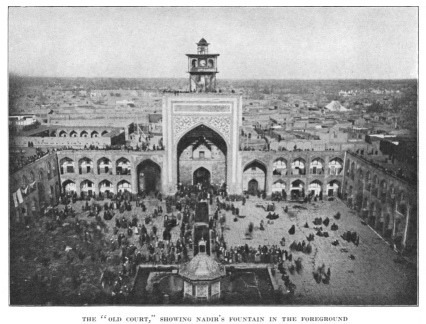 To the north of this courtyard is the mausoleum of Sheikh Hurr-e-Ameli (who was an important narrator of traditions and a grand Shia scholar). He was born in Mashqareh, a village in the Jabal Amel region of Lebanon, in 1033/1623. He passed away in Mashhad in 1104. His best known work is Wasayel-ush-Shia, which is considered to be a standard Shia reference work. 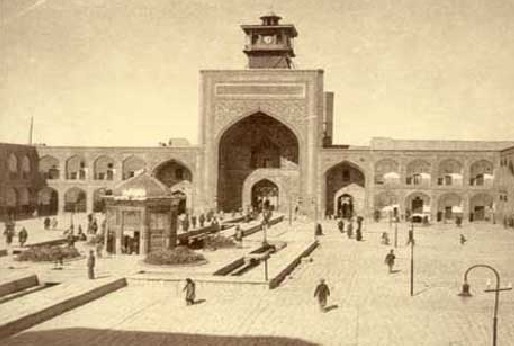 On the south side of the courtyard are two porches which lead to the Imam Khomeini courtyard. At the top of the portal is a clock, which used to be housed in the Inqalab courtyard. The clock was a gift from Muzzaffardin Shah in 1278, a monarch from the Qajar dynasty. This courtyard is located between the Museum building of the Astan Quds Razavi and the Gauhar Shad mosque. It is a recent construction (post 1979). It is linked to the porticos of Sheikh Bahai, Dar-el-Ebadah and Dar-us-Zuhd. There are two minarets on the south side of the courtyard. The central pool is in the shape of an octagon, it is a three storeyed structure. 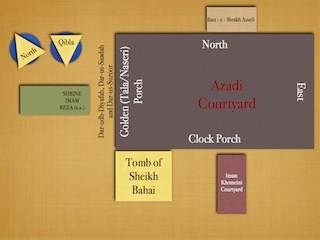 This is the smallest courtyard and is on the south side of the Gauhar Shad mosque , between the Sheikh Bahai sanctuary and the Imam Khomeini courtyard. The courtyard has four porches and portals. At the centre of the courtyard there is a drinking water fountain which resembles the al-Aqsa mosque in Bayt-al-Moqqadas, whose size is exactly one eighth of the original building of the al-Aqsa mosque. 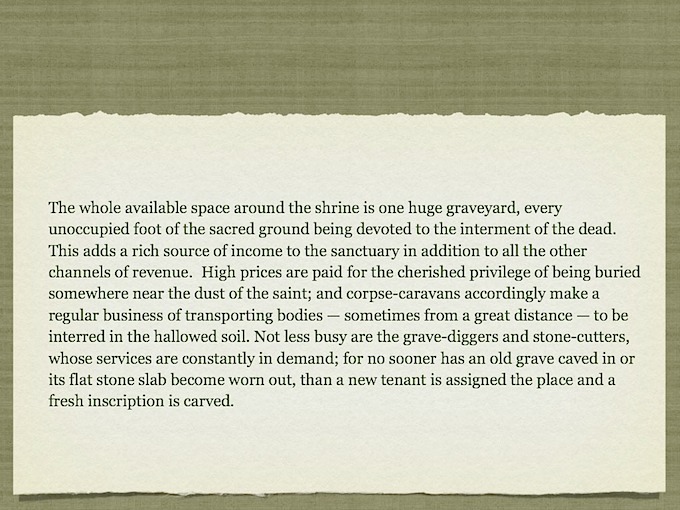 This is one of the largest courtyards in the Shrine complex. There is a bronze lattice window adjacent to the eastern porch (Tala porch) of the courtyard, which looks towards the Holy Zarih and is used by pilgrims who cannot enter the Shrine area itself. This courtyard also has a sundial.